Home > Diving > What is Aquarium Diving? Aquarium diving offers a rare opportunity for divers to see large sharks at a close proximity they can only otherwise dream about, and swimmers have nightmares over. Although sharks are not a welcome sight for surfers and other shoreline dwellers, these fascinating creatures hold great appeal for divers. However, despite shark scare stories regularly garnering newspaper coverage – in 2007 a ‘Great White’ was supposedly photographed off Cornwall until the photo was later found to be a hoax - it is actually very difficult to see sharks in the wild. 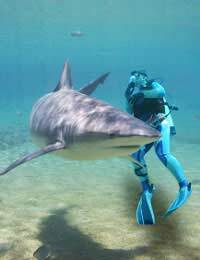 Not only is there is the worldwide problem of dwindling shark numbers, but also when divers do encounter one, the typical reaction is for the shark to swim away. Aquarium diving offers a great opportunity for divers and shark fans to realise their dreams and observe these fearsome creatures. It might remove the thrill of the chase and the opportunity of seeing sharks in their natural habitat, but nowhere else would you have the chance to see them up close and in such clarity. Aquarium diving is no ‘swimming with the dolphins’ experience - sharks are not friendly, playful creatures, and do not enjoy human interaction beyond biting them (although very few shark species are actually dangerous to humans). Instead, you are a passive observer, who must stay still in the aquarium waters as the sharks swims around you. If a shark does take an interest and starts to swim towards you, then it won’t be for fun and games, and a trained staff member will promptly duck you head down. Nevertheless, aquarium sharks are pretty docile because they are regularly fed and so not on the prowl for fleshy nourishment. Aquarium diving is not about exploration, but pure observation. The thrill is just in being in such close proximity to such remarkable and beautiful creatures – and without in fear of your life. It also offers excellent diving conditions with perfect visibility, so that you can see their teeth in great detail! For those keen to experience the wonders of aquarium diving, the UK is blessed with opportunities. The Blue Planet Aquarium in Ellesmere Port, Cheshire claims to be the home to more species of shark than anywhere else in Europe. Its inhabitants include lemon sharks, sand tigers, bamboo sharks, nurse sharks and wobbegongs. There are also southern stingrays and other fish found in the waters of the Caribbean. You don’t even need to be an experienced diver to experience the thrill. The aquarium offers a ‘Shark Encounter’ scuba session, as recognised by the Professional Association of Diving Instructors (PADI). Here anyone over the age of 16 can join the sharks underwater, and absolute beginners are taught basic dive techniques before descending into the novice tank. Divers that have attained the PADI Open Water level or equivalent, and can prove they’ve been diving in the previous six months, can join the more formidable inhabitants in the crystal clear waters of the Caribbean-like qualified aquarium. The Blue Planet aquarium has a PADI dive centre on site that means it can cater for all levels of ability while you complete courses there. For those shark admirers north of the border, the Deep Sea World in Fife, Scotland, offers another great opportunity for divers of all disciplines. Novices without any qualifications or experience, just need to undergo basic pool instruction before they are allowed in the shark tank. The aquarium is also home to sand tigers, as well as tope and angel sharks.